And I want to reiterate from the Presidential Residence that while I am serving as president of the country, I am never going to privatize the health system, I am never going to privatize potable water, nor education, but we are going to decentralize, because the local mayors have asked me to. And it is worth noting, that Suchitoto, led by an FMLN mayor, has its own decentralized, municipal-run water system, which was the reason Saca decided to speak there in the first place. Rodrigo Samayoa Valiente is an environmental consultant who previously worked for El Salvador's Ministry of Environment and Natural Resources and who has seen a draft of the proposed decentralization law for water systems. In a post in the blog Siguiente Pagina, he writes that the proposed legislation is not a privatization proposal, although it opens the door for that, if the local municipality wants to delegate its responsibility to a private entity. Under the law there would need to be a mutual accord between the central and local government and a gradual transition of financial and technical resources. SETA workers say that President Tony Saca is pushing a privatization proposal to comply with requirements couched in a 1998 loan from the Interamerican Development Bank (IDB). The loan provided money to “decentralize” ANDA, set up smaller municipal water companies and open them to public-private concessions. So far, 19 municipalities, representing 18,000 household water connections, are voluntarily experimenting with a variety of concession formats, which contract out water line maintenance and distribution to private companies. SETA workers argue that concessions are stepping stone to full privatization. “The government is exacting an institutional sacking of ANDA to justify the need for concessions,” says Wilfredo Romero, General Secretary at SETA. He notes that ANDA’s 2006 budget is 15% lower than 2005. Funding is lower than any time in the 2000’s—an amazing fact considering that one-third of the country lacks water in the home. According to the right-wing daily La Prensa Graphica (12/27/2005), the majority of this year’s cut—$13.3 million—came from the “investment” section of ANDA’s budget, a 37% slash from the 2005 level. This history shapes current dynamics between centralized and decentralized systems. There is recognition of the important role that local communities have played in the development of water resources, while at the same time there are national standards and control mechanisms to ensure that community-run systems are adequate. Despite tensions between local systems and AyA, this arrangement allows for the best aspects of centralized and decentralized management to exist simultaneously. State control allows for coordination among actors using the same river basins, introduces conservation and other broad goals as part of planning decisions, improves regulatory coherence and consistency across regions, and prevents powerful locals from usurping resources. Meanwhile, the contextual knowledge brought by local control allows reforms to respond to local realities and gives local citizens greater decision-making power regarding how resources are allocated and managed. It's worth noting that in the US, where clean water is largely taken for granted, the paradigm model is decentralized (water systems are usually at the municipal level and there is certainly no national water authority), and it is generally publicly owned and not privatized. While there are certainly all sorts of problems in applying a US model to a developing country, this example does suggest that decentralization and privatization are not inevitably linked. Decentralization, however, will harm the distribution of potable water to communities if resources are not available to the local community. Resources include both the capital necessary to build and maintain a drinking water system as well as the technical expertise to run the system. An example of a very decentralized water system is the community water system being built in Las Delicias, El Salvador. The project is sponsored by the Christian group Enlace. When this system is completed, it will bring potable water to almost 1300 households families who currently can only buy water from a local delivery truck, spending as much as 1/3 of household income to do so. Ultimately, the question of delivering healthy water to El Salvador's communities is primarily an issue of good governance. Democracy, transparency, accountability, responsiveness, and equity are the characteristics which must be required however the system is structured. 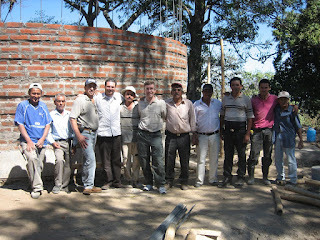 Tim at the main water tank under construction for the Las Delicias water project. I commented on this very issue on your post of July 3, Protests over water policies. I did an article published only a couple before on the water crisis and how communities are responding. Suchitoto, San José de las Flores and Nejapa were my main examples. Nejapa, especially, has been very succesful in bringing potable water to most of their communities, in fact, by the end of this year, 100% of their communities will have access to potable water. And like I said, mayors of the FMLN were the first to propose decentralization. But, everytime, if the FMLN asks for something and the government says "Good idea, we'll do it", then it becomes a bad idea, even if it's well implemented and brings good results. The political polarization affecting El Salvador has to stop interfering with the actual development of communities. Clean water is essential to the survival of communities and in rural areas more than 40% of the population do not have access to water services. The people most capable of giving these services to the comunities that need it are the affected communities themselves. The Cripdes protest was politically motivated, and their demands were ridiculous, but nobody wants to talk about that now because now they have become victims of a terrible "anti-terrorist" law, but we cannot loose perspective on essential issues. Water is one of them. Can decentralization lead to privatization? Yes, according to the plan, but only if the members of the community vote to have that become the way to do it because the community itself cannot manage to do it. By the way, that's the way Red Solidaria works. The members of the community decide how to use the money they get. They are the ones who vote if the priority is to build a school or a bridge or a road. And in the majority of the Red Solidaria projects, the FMLN mayors, which govern the largest population benefited with the Red Solidaria funds, are actively involved in the decision making, and are happy to do it. I've seen them. But I have also seen them turn around and say the most horrible things about Red Solidaria when they talk to the press. International solidarity organizations should be careful, and should separate fact from propaganda, unless, of course, it's propaganda what they want and not real change. Solava, I'll be the first to acknowledge that it was your comment on July 3 which prompted me to write this post. I think Solava answers the most important question, and that is does decentralization work. It may not work everywhere, but in the places it does work, those models can be copied and applied elsewhere. And if it does bring clean water to more people, then that is what is most important. I also think it's a great thing that one party is listening to the ideas of another, and implementing those that are effective. I'm not sure that happens much in the U.S. any more. For the FMLN, even if it makes Arena look good in the short term, they should realize that voters will remember those FMLN mayors that were able to get things done, and as those mayors move up the political food chain, that in turn will result in political gain for their party. It's not a good idea to fight something that could help solve a huge problem here. gold miners polluters of water; go home NOW!